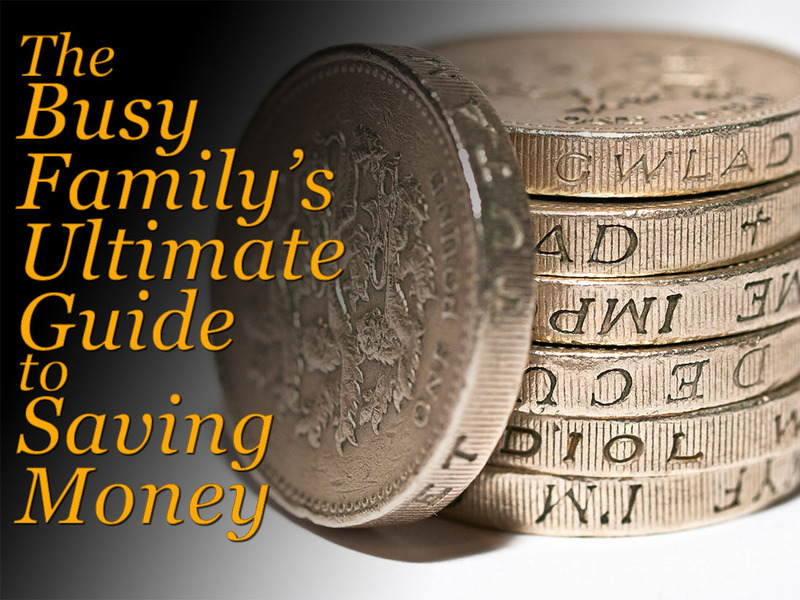 Welcome to our “ultimate” guide for busy families who want to save money. Hopefully you’ll find hints and tips here which won’t require you to spend countless hours or do things that ‘normal’ families just wouldn’t do. We’ll be adding to this feature as we find new tips. Feel free to add your own tips in the comments at the end of this (long) page! You will almost certainly buy, use and waste less food if you can create a meal planner. Ideally, create one for each month (or use the same one with modifications as required). Mark on the planner when you will be eating at home, any times when you’ll be eating out or getting a takeaway, plus events which mean one or more of the family won’t be eating at the same time. Then use this to plan the preparation and serving of meals. Why not get the whole family to join in planning favourite meals? You can even learn together about using leftovers, making two, three or more meals from a single joint of meat, and so on. If combining a meal planner with the next tips on cheap, deal, and seasonal shopping, it is worth building some flexibility into meals and recipes so you can take advantage of special offers. This is particularly important when it comes to different types and cuts of meat and fish. Create dishes which bulk out more expensive ingredients — like meat and fish — with cheaper ones such as beans and pulses. Consider not eating meat on every day of the week. The cheapest places to purchase fresh fruit, vegetables, meat, fish and other produce may well be a local town or farmers market. However, this often takes more time and may require shopping on a particular day or time. You also need to ensure that the quality is high enough. Seek out the cheapest supermarket you’re happy shopping at regularly. It is generally not worth going to more than one or two local supermarkets on a regular basis due to the increased time and fuel this can take, plus a lack of familiarity which can make hunting down bargains more difficult. Generally, supermarkets like Lidl and Aldi are the cheapest but may not have such regular or predictable stock as more major players. If you can be flexible in your meal planning and are sure you can use or store the produce you buy, then you can save significant money each month. Avoid convenience shops/corner stores, which by nature are more expensive. They’re OK to pick up the occasional loaf of bread or bottle of milk if the supermarket is closed, but most products cost significantly more than their supermarket equivalent. If you have the time, check out your local independent stores. They may not necessarily be cheaper than the supermarkets but you may find they offer good deals on some fresh produce. Where possible, buy food that is in season. It’s generally cheaper because it hasn’t been imported or grown in less natural conditions. Consider fresh, frozen, tinned or dried produce based on price and need. If you have a decent-sized freezer and cupboard/larder space, frozen, tinned and dried produce can be great value, keeps for a long time, and may be quicker to use. Factor in the energy costs of food preparation versus its basic cost. For example, two chicken joints generally cost proportionally less, and can stretch to more meals, than buying a pack of four chicken breasts. However, a joint of chicken takes longer to cook and thus uses more energy than, for example, grilling whole or stir-frying sliced/cubed chicken breasts. Deals can be great, but do check to see you’re actually saving money. Branded products are nearly always more expensive than own brand ones, which are more expensive than the lowest-priced value/budget labels. Deals become less attractive if you can’t use or store the extra produce, or if you use credit or store cards to pay for the goods and don’t pay the full balance off every month. Consider using own-brand and value label products wherever you can. The quality is generally very high. However, do check nutritional content as lower-cost products are sometimes higher in sugar, salt or saturated fat. As a general rule, pick value products where minimal processing has occurred (tinned vegetables and beans, for example, and basic dairy products) and pay a bit more for fish, meat, and processed goods. This will leave you more money in your food budget for items you must have but refuse to scrimp on. Try to avoid falling for marketing gimmicks and fancy promotions from the big brands, and teach your children about food so they understand that ingredients are more important than brand names. Minimise or eliminate ready meals. Not only are they generally less healthy, they are also very expensive for what you get, particularly for a family of four. That’s not to say you can’t use any timesaving ingredients or have a treat now and then, but don’t overdo it. Far better to learn to cook with less processed ingredients. It’s also a great way to involve the family and teach kids about food and cooking. What is more beneficial — how to make a simple, healthy dish or how to set the timer on the microwave? Build up a store cupboard of staple items with a long shelf life — for example cans and packets — so there is always something you can make a simple meal with when you need to. Unfortunately most of the cheaper supermarkets don’t offer the option of shopping online and delivery, but if you’ve chosen a supermarket that does, online shopping and delivery can be a real time saver. It may also save you money as you are more likely to stick to a list when shopping on a web site. However, you may miss deals. It’s also worth taking into account the delivery charge. “Real” shopping can be stressful but it can also be educational and even (occasionally) fun! You need to balance time, money and stress considerations for this one. Where possible, cook in bulk. This is particularly useful for sauce-based dishes — bolognese, curry, chilli, stews and casseroles — where cooking a double or triple quantity in one go is more efficient (provided you have cookware large enough and storage space in the freezer). The frozen meals can more quickly be reheated, not only saving energy but being a great timesaver on days when time is short. Invest in a slow cooker — they’re generally not that expensive and are relatively cheap to run compared to other forms of cooking. They are more versatile than you might think, and are great for creating dishes with minimal preparation time. You can also prepare meals ahead of time and have them ready when you need them — often when the house is too busy or manic to be preparing and cooking food. Find out how to use leftovers rather than throwing them away. There’s nearly always something you can do to create a new meal or snack. Eat together whenever you can. While this doesn’t necessarily save money directly, making a deal out of meals means you may eat more slowly, digesting properly, and possibly eating less, rather than gobbling down a TV dinner in five minutes flat. Stay hydrated. Drinking water is beneficial for so many reasons. As well as keeping hydrated it can help to regulate/reduce appetite (particularly as dehydration can sometimes be misinterpreted as food hunger). If you do treat yourself to takeaway meals, try to find a dish that everyone will enjoy and then find the best deal. Find out what nights your favourite eatery does deals and have your family takeout night then. You’re probably already making lunch for your kids, but why not do the same? The cost of buying lunch every day soon adds up and there are much more exciting things you could spend the money on — or save it. Packed lunches don’t have to take a long time, and they don’t have to be boring either. If you have a fridge and a microwave at work, you could even plan to use some of the meal leftovers as lunches. Use plastic/Tupperware lunch boxes rather than foil, clingfilm or bags. It will save the food from getting squashed, means you can pack in a variety of food including soft fruits, and will save a lot of money on wrapping. We’re all told to switch gas and electricity suppliers, but it’s important to be smart about it. Don’t simply compare variable rate tariffs, particularly in the autumn and winter when energy companies seem to put up their prices. If you do, you may switch to a cheaper supplier only to have them raise their unit rates. Instead, look for fixed rate deals. Generally, the longer the fixed rate tie-in, the higher the unit prices are and the greater the penalty charge for breaking contract. However, in a world where it’s unlikely energy prices are going to come down any time soon, this may be a smart move. Even if you don’t want to switch supplier, or are on a prepayment meter where deals are extremely hard to come by, if you have never switched or compared prices then you may be able to get a better deal with your existing energy supplier. If you’re currently on a prepayment meter simply because you moved into a property where it was fitted, or you were in financial difficulties but now have a better credit rating, it is worth seeing if you can have a credit meter fitted. Not all utility companies will do this, and some may charge, but if you can switch to a credit meter you’ll have access to the entire supplier market. It can be worth looking into dual-fuel discounts, where you get gas and electricity from the same supplier. Don’t be swayed by tempting but ultimately insignificant deals such as nectar points or vouchers. They’re nice to have if you’re already getting a good deal, but shouldn’t be a reason to switch in themselves. Paying by direct debit is usually the most cost-effective way of paying for gas and electricity, particularly if you sign up to pay a monthly fee based on your annual energy usage. Work out the best timing pattern for your central heating and water based on your family’s lifestyle. Generally, the more flexibility your boiler and thermostat controls offer you, the more money you can save, but even a basic but efficient system is better than none at all. Having a hot water tank installed can be more convenient and cost-effective than ‘on demand’ hot water from a combi boiler, so long as the tank is well insulated and is not set at a temperature above 60 degrees celsius. It costs less to heat a dry house than a damp one. Do all you can to minimise the effects of the moisture produced on a typical day, particularly from the bathroom, kitchen, and from drying clothes indoors. Combine lower temperature central heating with the use of extractor fans, dehumidifiers and ventilation, to keep condensation and damp levels to a minimum and allow your central heating to work more efficiently. A drier house tends to feel warmer, at the same absolute temperature, than a damp one. Use other heat-generating appliances to your advantage, so long as you would have used them anyway. For example, leave the oven door ajar after it’s been switched off, to push warm air into the kitchen. It has often been suggested that unused rooms should have their radiators turned off and the doors closed. However, this can lead to damp problems in those rooms. Generally, it’s better to have a low level of heat in all rooms. Fitting internal draught excluders is beneficial to restrict the flow of air between rooms of differing temperatures. It helps to cut down on draughts, which can cause people to feel cold. Use energy efficient lighting. Low-energy bulbs are more expensive but they tend to last longer and use far less energy than standard bulbs. This is particularly important if you need to keep one or more night lights switched on. Teach your kids about why energy efficiency is important for both the environment and saving money. Check the energy rating of new appliances, particularly white goods. A family in particular makes significant use of washing machines, driers and fridge freezers. You may pay more initially for goods with high energy efficiency rating but their running costs should be lower. Why not get the family active around the house, or outside, and then have plenty of snuggles together? You may not be able to do without the heating for ever (and babies, younger children and older relatives in particular need the house to be warm) but make the most of active games and each other’s body warmth. Learn how to make basic repairs to clothing. At the very least, button and patch sewing can be very useful. Clean appliances, particularly things like fridges and freezers, to ensure they are running at their best. Keep freezers well stocked, and keep refrigerators about two-thirds full, allowing cold air to circulate. Items which need to be kept coolest should be stored towards the bottom of the fridge. Buy a fridge thermometer so you know what temperature your fridge is running at, and then set the thermostat dial so that it runs at between 1-4 degrees celsius. Find out and implement basic maintenance on household electrical appliances to keep them working fault-free. Find out what basic things you can do if an item goes wrong. Cut down on the amount of detergent you put into the washing machine each time, as the instructions usually tell you to use more than you need. Wash at the lowest temperature setting possible for the items you are washing. Modern detergent often works better at low temperatures and you save money on the electricity required to heat the water. Don’t be proud… find out when friends and family are upgrading or replacing items – clothing, appliances, furniture – and ask if there’s anything your family could use. Join a babysitting circle or get to know your neighbours and offer to take turns looking after each other’s children. Obviously you need to know you can trust them, and unfortunately you always need to be a little wary if you’ve not really got to know them before, but you and your kids could make new friends as well as saving money if it works out. A family-size dishwasher is a good investment so long as you have enough dishes and cutlery for you family to use while the dirty stuff is waiting to be washed. Alternatively, find a model which has an efficient mode for half-load washing. Modern dishwashers use less energy than the equivalent amount of hand-washing, so long as the hot water setting is dialled down. Skip the automatic drying cycle at the end and leave the door ajar for natural air drying, to save even more electricity. We all know the brands that attract the most attention, and have the best appeal, but you don’t have to go for the latest versions of fruitily-named devices. Decide what you want to do with your gadget and then go online to find out the best one for your needs. Consider waiting until a new model of a particular gadget is released and then buy the existing version. You’ll often get something that does everything you need but at a reduced price. Having said that, it can be a false economy to buy a computer which is more than a couple of years old. Find cheap or free ways of communicating with friends and family. If you can’t meet up, consider using Skype or social network chat which (assuming you have broadband) is free to use. Ditch or reduce the cost of a landline. With the advent of mobile, many people don’t use a landline any more. Sometimes you need one in order to have broadband or other services, but you don’t need to pay a package subscription for bundled calls and other gimmicks if you never use them. Consider moving to pay-as-you-go (non-contract) mobile phones if you don’t use many calls, texts or data (mobile Internet). You often pay a premium on a contract in order to pay for the handset. If you don’t need all the bells and whistles, pick up a cheaper handset and then just pay for the calls you use. Use mobile Wi-Fi hotspots, and use your wireless at home, whenever you can. This reduces your mobile data usage. Ensure your mobile devices are set not to update their software and apps automatically, particularly when you’re away from a Wi-Fi connection. Kids are generally happy with inexpensive items so long as it keeps them entertained by feeding their curiosity, imagination and likes. They don’t always need expensive craft items, toys and games. Video games are great but don’t succumb to the latest titles just because your kids demand them (in any case, some really aren’t suitable). Seek out family-inclusive and long-term appeal games which are either fun to play together or aren’t ‘solved’ or completed after a couple of weeks. Also, check out free online games (but be wary of sites which bombard you with adverts). Use websites such as Lastminute.com to find deals on days out, events and shows. Use your local library. Not only will you be supporting it, but you can get a huge range of books, CDs and DVDs for the whole family. They may not be the absolute latest blockbusters or releases, but consider whether you really need them. Buy electronic versions of books. Print books are fantastic, but if you have a Kindle, Nook or other e-reader, the electronic download version is often cheaper. You can sometimes ‘hire’ digital books as well. Be careful, though, as it can be all too easy to click and buy books without thinking of the cost. Consider whether you need a particular satellite or cable subscription. If you rarely or never watch the channels included in a package, either downgrade or cancel completely. Unless you are a huge sport or movie buff, you may find much of what you want on a subscription-free service like Freeview or Freesat. Don’t succumb to paying to hire or download the latest movies on a whim. The BBC iPlayer and other services often have free films, dramas and kids TV, and some TVs and other devices including games consoles now let you play them directly on the television so you don’t have to huddle round a laptop or tablet. Make a point of discovering your town’s local amenities. Many, such as parks, libraries and museums, are free and may change attractions/exhibits over time. Find out what events are coming up in areas near you. There are often many free or inexpensive ideas for days out. Check out council, events and arts web sites and make a list of event dates. Avoid going to shopping centres just to seek entertainment. Instead of throwing out or recycling clean household materials, find creative ways of using them for craft projects. Make a “bored jar” which you fill up with various (cheap/free) ideas for what to do when anyone mentions the ‘bored’ word. Ideas include craft activities, drawing, reading, playing a board game, cooking, doing a puzzle or some colouring, making a puppet, writing, making up a story, and so on. Employ the ten-second rule. When picking up an item and putting it in your basket (whether that’s real or virtual online) stop for ten seconds and evaluate why you are buying it, and what you need the item for. If you can’t come up with a good reason, put it back on the shelf or remove it from your online cart. Buy items second-hand or nearly new. Going online to sites like eBay and Gumtree, and using a bit of common sense, can save you lots of money and you’ll still end up with decent items. Don’t be afraid to use charity shops. You may pick up a bargain. Grab some courage and learn to haggle a bargain. Even high street stores are prepared to offer a discount particularly if you can pay in cash or buy more than one item. Buying presents for a huge number of friends and relatives can be a daunting and expensive task. Consider having a ‘pact’ with friends not to buy presents — perhaps have a night out (or in) together instead — and do a ‘lucky dip/secret Santa’ for not-so-close relatives. Homemade gifts can not only save money but the time investment shows the recipient you care. You don’t have to be a whizzy crafter or chef to do this, just pick an activity that doesn’t cost huge amounts to do, is relatively simple, yet has a good end result. Buy non-perishable items for the following year’s occasion just after this year’s has passed. For example, Christmas cards and wrapping paper in January. Avoid store cards but make use of loyalty cards where you can gain points. It’s usually more beneficial to simply knock the balance off future bills. That said, don’t change your shopping habits simply to collect points as the deals aren’t worth it. Just buy what you’d normally buy and take the points as a small bonus. We’re not sure if this is true, but someone has suggested that filling your car with petrol in cooler weather means you get more fuel for your money, as petrol expands in the heat. Try to spend coins before breaking into five, ten or twenty pound notes. Take loose change with you and try to make up the right amount, or at least offload a few coppers, with each purchase. Save up all those “low value” coins (1p, 2p and 5p) which can be hard to spend, and when you have a large amount take them to a Coinstar machine (or equivalent). Do this when you want to spend some money in the store where the machine is, as you usually get a voucher to spend that day. Although the machines take a percentage of the value of the coins, it’s better than having them sitting at home in a jar. If money is very tight one particular month, you can often ask mortgage and utility providers for a ‘payment holiday’. They may allow you to miss one or more payments, making up the difference later on. If you are in good standing, they will usually agree to this as it’s cheaper all concerned than getting into difficulty and missing a payment. Above all, avoid ‘payday lending’ – short-term high interest loans. They can be used as a last resort but look to other sources first – friends, family, selling items, your bank.